Rebecca Sherman and I met ten years ago when we worked at the same art magazine, and we became friends over trips to art shows. I’ve seen her work change and develop over that time, but we’d never really sat down to talk about how she thinks about what she does. 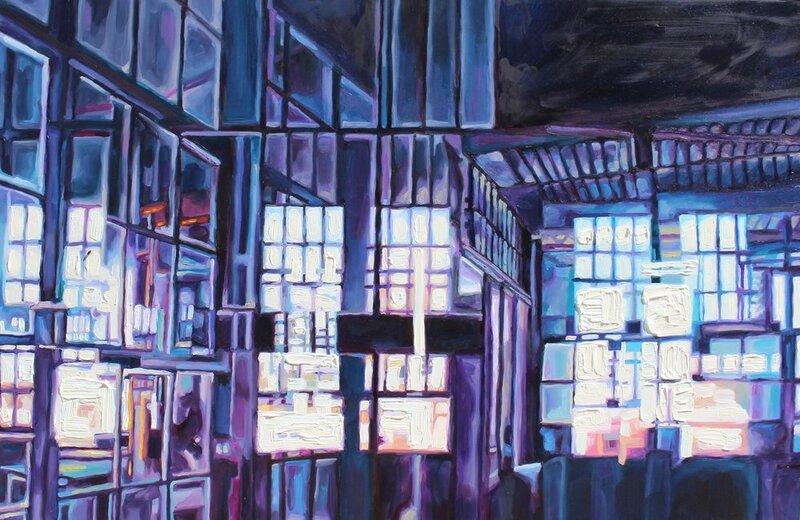 Rebecca’s paintings are dense, semi-abstracted views of commercial and industrial spaces that pay hyperreal attention to reflection and light. In our conversation in her Greenpoint apartment, she explained the way her work embodies her thinking about New York City, and how it has evolved in response to her changing emotional and geographic location here. Photography has also been an important tool for Rebecca. But even as her process has incorporated Photoshop, digital photography and a more sophisticated approach to planning her final images, the pleasures and surprises of the act of painting remain essential to her work. RR: I wanted to ask about the role New York City has played in your work, and how it’s changed over the years. A lot of your paintings are really specific about place. How has that played out in your paintings? RS: I moved to New York City 18 years ago to pursue my art. I was painting portraits at the time. The city eventually became my muse. My earlier work is inspired by the overall experience of the city— walking through Manhattan at night with your headphones on, seeing all the buildings and lights go by. I connect my personal experience to our visual, collective memory of New York (that has been shaped by film, photography and painting). RR: How did you get from portraits to painting buildings and the city itself? RS: I was always inspired by Kandinsky, and other modern artists who tried to create visual representations of music. I also wanted take the experience of New York City in cinema (with a soundtrack) and reflect that in my work. I thought about moving through the city, this very-fast paced place where things are changing all the time. But how could I capture that, how could I transform the sound and the experience into a flat image? My work strives to become a dual representation of our internal experience in the city and the literal space that we are in. Our experience and memory is changing as the space around us changes. RR: How have your depictions of the city changed? RS: I was studying abroad in Paris in 2002, and I visited the Hall of Mirrors in Versailles. The space made me realize that reflective surfaces in architecture can become great visual tools. Mirrors and windows abstract the space, create infinite space and are a gateway to the intangible. When I came back to New York, I started making paintings of hotels in midtown with mirrored interiors. These paintings unintentionally reflected my post-911 anxiety. They depicted large crowded interiors and it felt like you couldn’t get out. I eventually wanted to make paintings that were more intimate. I was living in the East Village and began to walk down the streets in my neighborhood and photograph bars and restaurants through the outside windows. I thought about taking Edward Hopper’s café paintings and turning them inside out. My paintings represented the emotions of these spaces and my own personal experience of the city at the time. Eventually I moved to Brooklyn and I was looking at the city through a new lens. In Brooklyn, you’re on the other side of the water and see the skyline every night. I started painting cityscapes that depicted changing, fluid buildings that blended into the water. And now in 2017, I’m focusing on industrial spaces that have been here since the Industrial Revolution. These spaces used to be factories and are now taking on a second life. They have become art spaces, museums, location buildings and offices. In this series, I’m exploring how these spaces, the city and America has changed over time. I’m also using these spaces as a metaphor for our individual, personal experiences. RR: A theme that runs through your work is this idea of compression. You're taking multiple photographs of a certain space, compiling them in your imagination and re-picturing of them as a painting. And that idea is also built into the spaces themselves—these buildings compress a lot of the history, they show traces of the lives that were lived in them in the past. Your paintings, you said “crush it all together”— smashing together planes and colors and light. These elements are pushed together, and the end result of compression is the explosion of light and energy. Some of them remind me of a universe exploding. RS: I think that all comes from the desire to live in the moment, and to capture the moment. We have these fleeting experiences that are intangible and ephemeral. I hear a great song, I feel euphoric and I just want to capture it. How can I capture this moment, when things are constantly changing and moving? RR: I wanted to ask you about how you use photographs in your work. RS: Photography has always been a really big part of my process. When I was younger and experimenting, I took a box of mirror paper, went out into the middle of Union Square, and threw the mirror paper on the ground. I took photos of the reflection of the city lights and the architecture in the mirror paper. It totally abstracted the city. Before I had a digital camera, I would photograph architectural exteriors and interiors with my 35mm camera. When I took photos looking directly into mirrors and windows, I was so excited to get the images back to see how the light and reflection would unexpectedly abstract the space. That was when I began to toy around with the world between abstraction and reality. I base my sketches on the photos. And then in the painting, I push the abstraction further. Eventually, my process became more digital and complicated. I take a bunch of photos, layer them in Photoshop and create complex, digital compositions. I often strip the photos of all their color and create unique color palettes. The color palettes have recently been inspired by my travels abroad. So, I use photography and Photoshop a lot in my initial sketching. Then I create a pencil sketch on the primed, wooden panel. And then I make the painting. I look at the printed photo juxtaposition as a point of reference, but I let go of it at a certain point, and let paint do what paint can do. RR: We’re here looking at two of your paintings, one from 2004, which shows a warmly lit restaurant in the East Village, through a plate glass window. It feels intimate but the viewer is on the outside looking in. The more recent painting shows this vast space with light bouncing everywhere, and at the center is this bright, impasto form that reads as an overwhelming white light. The overall effect is disorienting and hyperactive and also really beautiful. It feels like quite a journey from the light in the restaurant to the light in the later painting. How do you now approach rendering this thing that’s so difficult to pin down? RS: I love painting, and I love painting in oils. After taking the photos, working on them in Photoshop and sketching in pencil, I get really excited and anxious to get to the painting part. I use a lot of the old-school painting techniques, I’m really inspired by post-Impressionism, and I love painting really thick paint. It’s true that the light source is a really important element in my work. I start with the dark colors and then I layer on lighter and lighter colors. I love just piling the lightest, bright white on the panel. It becomes very sculptural and does what the digital piece, or what photography can’t do. I know that’s a really old notion—what can paint do? I get more into it and more excited about it, having the light really come out at you and having the dark recede. The light plays a big role because it’s the natural element that helps abstract the space. It creates possibility and reflects the energy of the city. So it’s something I really try to play up; using paint as a tool. RR: I like that you bring up that the point that paint does something that the photos can’t. I think your work poses this interesting question. You’re photographing these places, but there’s obviously something you see that the photographs are not recording, which you’re trying to add back by painting. RS: I think it’s that internal experience. Even though you can create abstract images with photography, I’m trying to be more expressive and depict a feeling in a unique way that only painting can. The more time we spend on our phones and on the computer, the more I value painting and creating by hand. The experience of creating work by hand is different, the work itself is different and the way people view it is different. RR: For sure. The irony always is that when you’re writing about art, it’s going to be a digital image on a screen or reproduced on paper, so you lose exactly that thing that you’re talking about. But all the more reason to see them in person, then, I think.